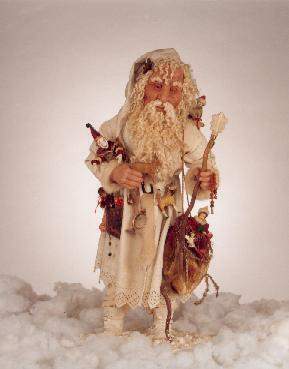 Santa's embroidered, cream robe is an antique Victorian "baby jacket". Vintage "kid skin" white leather baby boots have exceptional detailing. Vintage "batted felt" covers his body and makes up his wonderful pants. Creamy mink trim encircles each cuff and runs down the front of his coat. 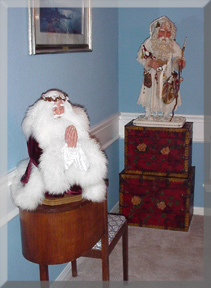 Antique brocade cotton/silk make up Santa's hat (notice the hand-embroidered edge around his hat). Vintage "bullion gold" tassel hangs from the hat tip, accented with a hand-dyed antique, woven, red bead from India. I used these wonderful woven beads throughout the piece - as berries with the velvet Holly leaves accenting his hat, hanging from his staff (each one is laced through a tiny "bullion gold" cord and accented with vintage gold jewelry findings). Atop his "corkscrew willow" staff, I've attached an antique glass lamp finial. Santa's incredible beard is from a breed of mohair goat that is trying to make it's way back from the engdangered species list. It's hair is unsurpassed in the intensity of curl. These endangered goats are not harmed when the beautiful locks are sheared once a year. Santa's many accessories include this charming little clown in the crook of his arm. The fabric in his costume and the delicate sequin accents are made from real silver. They came from an antique garment from India. Silk and velvet ribbon add even more detail to this one-of-a-kind, handmade treasure. 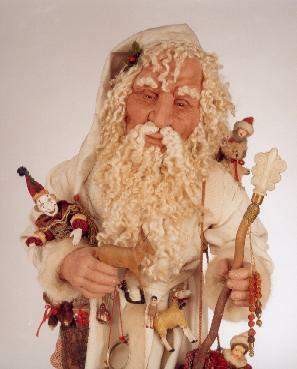 Cascading from Santa's shoulders are two bags. One is 17th-centry velvet and "bullion gold" pouch purse with gold silk lining. Wonderful "bullion gold" woven beads hang from each corner of this bag. The other bag hangs from a vintage silk cord. This piece was originally a hand-dyed, Victorian table-topper - now fashioned into a luxurious Santa bag. 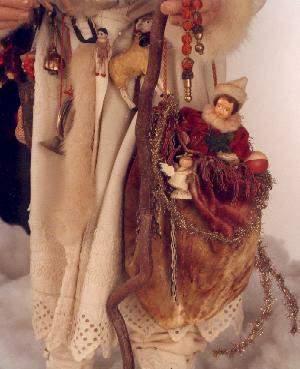 Some additional treasures hang from Santa's creamy white leather belt - a hand-carved wooden doll, a vintage replica of an adorable sheep with silk collar and vintage bell. Santa's bag of oranges (a mainstay gift in Victorian times) is truly special, because each orange was hand-made by my 15-year-old son (check out how detailed they are). 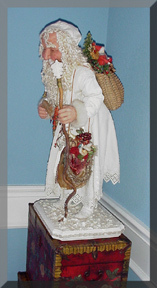 Two "batting" dolls are tucked away - one in Santa's bag, and the other in the "handmade woven basket" on his back. An assortment of wonderful wooden toys are placed throughout this piece: an angel (from the 40's), 2 soldiers, a wood ball waiting for an expectant child, a silk horse from India, a straw donkey from South America, a celluloid (vintage) elk, an extra special hand-carved deer from Sweden. You'll find vintage bells throughout as well. Antique (tinsel) "garland" as a unique bit of "glint" to this piece. A silver horn on a silk cord, berries, greenery garland and more pull this piece together to make it one of the most wonderful Santas I've ever created. Did you notice the sparkling snow? It is made with vintage "mica" flakes - just like they used hundreds of years ago. Don't forget to take a good look at all the fine detail in his face and hands (check out his finger nails) and his beautiful blown-glass eyes - can you see the tear ducts in there? P.S. This guy's name is "Josiah". He doesn't eat much - a couple of cookies around Christmas time should hold him for about a year!